While social media has altered the rules of digital marketing, search engines like Google still remain undisputed kings, when it comes to the way people find information online. It all starts with words people type in the search box. If you can rank for the right keywords, you can quickly start to meet your digital marketing objectives. However, choosing keywords for SEO isn’t just about ranking for high-traffic words. It is about choosing words that are most relevant to your business and can give you maximum conversions. You would need an Adwords account for this. Keyword Planner is a free tool by Google that generates keywords ideas for you, along with their estimated performance. You can use Keyword Planner to get the total volume of traffic that keywords for SEO generate. In order to get that, simply choose the Match Type as Exact, and look for data under the Monthly Searches column. The actual traffic a keyword generated would depend on your ranking, but it is a good starting point to select keywords that can give you high search volume. Sift through the list and select keywords that can potentially generate moderate to high traffic volume. A few years back, Google discontinued its nifty visual keyword research tool called Wonder Wheel. However, Google replaced it with a new tool called Contextual Targeting Tool (CTT), which runs on the same engine as Wonder Wheel. While CTT is meant for display search marketing, you can always utilize it to choose SEO keywords. You can find CTT in your Adwords account, under the Tools and Analysis tab. Key in a phrase and the tool will throw up a list of related keywords. For example, in our online jewelry store example, key-in the phrase ‘online jewelry store’, without the quotes. You will get a list of similar keywords that people are using to search for related products or services. On the left-hand side, you will see the root word or phrase, and on the right side will be phrases related to the root phrase. CTT is a great tool to generate ideas for SEO keywords. Once you have your basic keyword research in, it is time to pick keywords that you want to focus on for your search engine optimization efforts. There are a lot of factors you can take into account to do that. The more in-depth you go, the better will be your investment in SEO efforts. If you want to rank for a keyword but aren’t sure if it will prove profitable, you could use a sample paid search campaign to make an informed decision. In your Google Adwords account, select ‘Exact Match‘, and set up a test campaign for the said keyword. Run the campaign for about 200-300 clicks. It isn’t going to cost you much. See the kind of conversions you get, and if they meet your targets. For example, if the test campaign cost you $100, got you 5000 impressions, 100 click-throughs, and 3 conversions amounting to $250, you ultimately made a profit of $150. That’s good enough for you to invest in SEO efforts for the particular keyword. According to research reports, high-traffic keywords actually make up just 30% of all the searches performed on the web. The rest 70% is taken up by long-tail keywords. Long-tail keywords might not match up in terms of traffic volume, but they can give you better conversion rates. The reason behind that is simple: people using long-tail keywords to search are much closer to making a purchase. For example, someone typing ‘online jewelry‘ is probably just browsing the web for ideas, whereas a person typing ‘best gold jewelry offers‘ is probably just seconds away from opening his wallet. Simply because you have an online jewelry store does not mean ranking for ‘jewelry‘ should be your ultimate goal. One, ranking for such a generic term is almost close to impossible unless you are a really authoritative website. Two, a person typing ‘jewelry‘ could be looking for anything, such as junk jewelry, cheap jewelry etc. Unless you have those products on your store, you would just be fetching a lot of useless traffic. Instead, focus on keywords that better match your products or services. While you want to rank for the most competitive keywords out there, ranking for them can take a lot of time and money. It is thus prudent to keep a healthy mix in your keywords for SEO. For instance, if you have zeroed down on a list 10 keywords for SEO, you could have 2-3 really competitive keywords, 3 moderately competitive keywords, and 4 specific, long-tail keywords. It is important that you choose SEO keywords that are as relevant to your business as possible. Leverage variations in key phrases too to your advantage. For example, variations of ‘jewelry store online‘ could be ‘Jewelry e-commerce store‘, ‘online jewelry shop‘ etc. 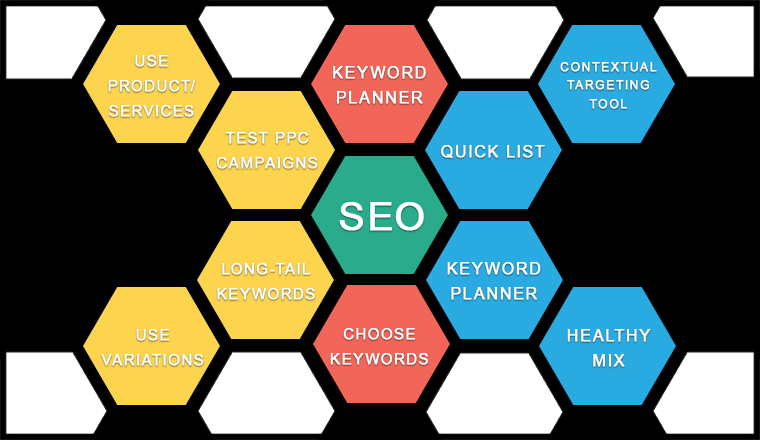 Whether you decide to do SEO on your own or hire an SEO services company, it all starts with comprehensive keyword planning. Get this part right, and you have won half the battle.